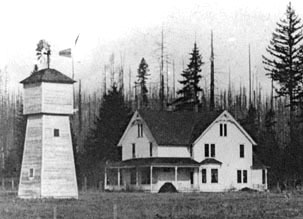 When the family home burned down in the 1902 fire, Jim set about building his dreamhouse. Pristine white, 3 stories high, complete with working windmill, gingerbread trim at all three gables, a front porch supported by white pillars reminiscent of JM's southern background, and a bay window for Mary, the house was finished in 1908. The townspeople called it the McCutchen Mansion. Notice the backdrop of burned trees. 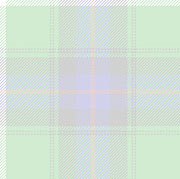 Click here to see an enlarged view. It was JM's dream that he'd have a house big enough to have a separate bedroom for each of his eight children. He built a house with the master bedroom on the ground floor, 5 bedrooms on the second floor and room for 3 more on the third floor. By the time he'd finished the second floor, some of his boys were grown and gone so he never did finish the third floor. Even when he began building the house, JM was going blind. The house was built to accomodate this, with a straight shot from the front door to the back door. After the Yacolt Burn, there was a lot of timber on the homestead that was burned but still useable. Jim and the boys used horses to log it for lumber for the new house and to sell for money to get other things for the house. His family of growing boys provided most of the labor. It cost him $3000 to build the house, a great sum of money in those days! 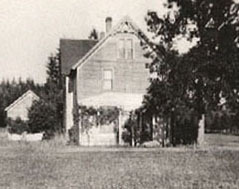 The house was finished in 1908. Taken 9 years after the Yacolt Burn, still shows the devastation. My mother was 6, living on a farm in LaCenter at the time (About 20 miles from Yacolt). She said it was like ashes were raining from the sky and she could hardly see. Her parents put her and her sisters on horses after tying white rags to their arms so they could see them in the smoke. Then they all headed away from the fire towards Washougal. People in Yacolt buried their valuables in the ground and took their children and animals and left. JM was never a logger except out of necessity. He preferred raising horses. JM was, as most farmers and ranchers were in those days, a jack of all trades. He grew and sold many things besides logs and horses, from eggs to cattle to hay in Nevada and in Yacolt. But above all,JM was a horseman. 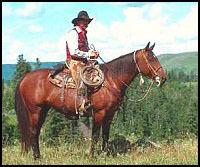 From his early teamster history he made a natural transition into horse rancher when he wanted to settle down and raise a family. When he left Nevada, he brought a herd of horses with him. And in the Yacolt area, his special sorrel horses gradually became well known. See some good photos of McCutchen horses in Dry Farming in Eastern Oregon). Right: Cira 1900-1905. Avie and Will working with some of the colts the family was raising. As the children grew and left home, the house began to see weddings. The boys all married in their 30's or late 20's but the girls were younger. 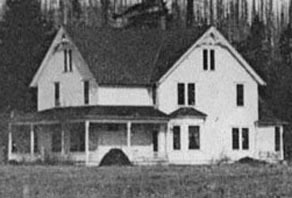 In 1913, Avie, the oldest daughter was married in the house. In 1916, both my father and his youngest sister, Charlena, had their weddings in the house. To my knowledge, Charlena's was the last wedding the house saw, at least while in McCutchen ownership. 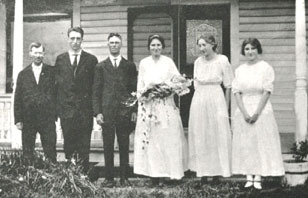 13: My parent's wedding party, standing in front of the porch. Notice the etched window in the front door and the white pillars on the porch. Also notice the absence of a lawn. Even in the 50's we had little lawn. From the left: Harry Hooper (who later married Charlena), Cal, George, Myrtle, Anna Olson (my mother's best friend until she died an old lady), and Charlena. In 1914, Willie Landon started growing hops in Okanogan County, near what is now Wenatchee. He brought some of his hops with him when he came to visit. Mary planted them around the back portch and generations of McCutchens watched them grow and enjoyed their shade. See hops. 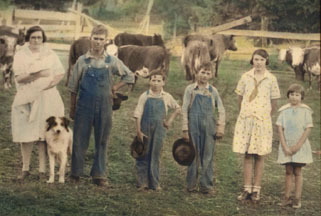 Mary Landon McCutchen, in her late 60's, with my father, George, and children, Edith and George, Jr.
Cal, the youngest McCutchen boy, was one of the many loggers in the community. 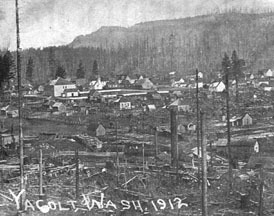 At age 30, he died in a logging accident. He was unmarried and the first of the family to be buried in the family plot in the cemetery which the McCutchens donated to the town of Yacolt in 1913. 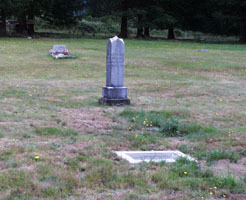 The McCutchen marker is the tallest stone in the cemetery and easy to find. JM McCutchen, Mary McCutchen, Calvin McCutchen and George McCutchen share the stone, with a name on each side. 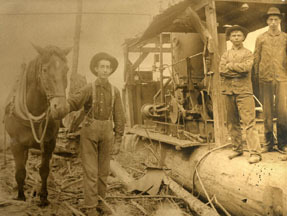 Cal (holding the horse) with logging equipment similar to that used on the McCutchen homestead, not long before he was killed, in 1917. 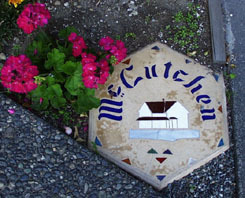 The McCutchen headstone. The stone in front belongs to my mother, Myrtle Evelyn McCutchen Steigers. 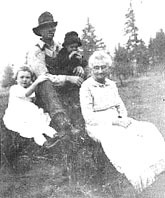 In 1919, when Jim was 85 and Mary was 64, my parents, George and Myrtle, moved back from Eastern Oregon and took over the running of the farm. 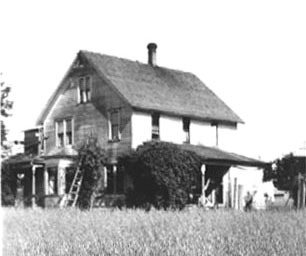 Jim and Mary continued to lived in their dream house, with my parents, until they died, he in 1922, and she only a few years later. At their death, the ownership of the farm was shared by all 7 remaining children. My parents never bought out their siblings but they lived on the farm for over 25 years and raised 5 children there. They had a sixth (me) after they left. Larger view and more photos, including one of the famous frame and glass. 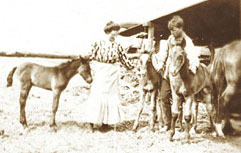 Photo 17: Myrtle holding baby Ralph, dog Teddy, George, Robert, age 9, George, Jr., age 12, Edith, age 13 and Lucille, age 10. Taken in 1930 in black and white, then hand painted by my mother's Aunt Lulu Cole. A traveling photographer just showed up at the farm one day and offered to take this photo, overalls, cows and all. He was selling the huge frame which still surrounds the original photo. It is oval, ornate and has curved glass which he insisted was nearly indestructible. He dropped it on the ground to prove his point and sold my parents when it bounced but didn't break. The house didn't change much over the years. It got a little older, a little more weathered looking, but it still had the same shape. 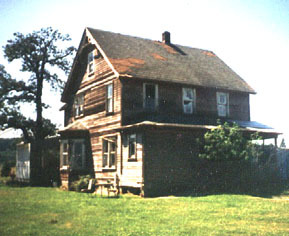 Except for the back porch, shown below, there were never any additions to the basic building while the house was in McCutchen hands. 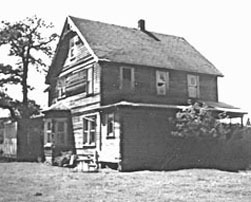 Photo 18: The house in 1936, from the northeast. The addition on the right housed a bathroom with a flush toilet (outside because it was too dirty to be placed inside, of course) and a back porch with hop covered railings. The bay window is seen here, with the vine of the McCutchen white rose rising along its side. The white McCutchen rose next to the bay window was planted by Mary. Cuttings from in have graced many McCutchen homes through the years. The the hops on the back porch were the remnant of the daring although unsuccessful hop growing venture. The hops and the rose were still there when I lived in the house 20 years after this picture was taken, but they are both gone now. 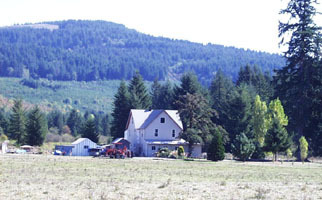 In 1936, Cap (Eldon),William's only son, bought the farm from the family. He and his parents lived there until 1951, when he sold it OUT OF THE FAMILY. The family was very upset, but no one would put up the money to buy it and keep it in the family. Although there are many photos of family members of other branches of the family, there are few of the William McCutchens. 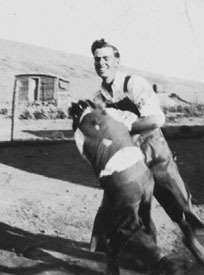 Cap in his early 20's wrestling with my brother George. He was 27 when bought the homestead. I especially remember that he liked to wear a cowboy hat, slanted jauntily to the side of his head, and that he told wonderful stories. 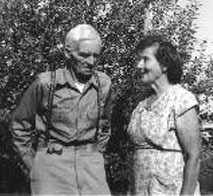 My Uncle Bill and Aunt Clyde, taken about 5 years after they sold the farm. I came to live with Cap and his parents in 1946, when I was 7 years old, and I lived there on the farm until it was sold. Thus, all of George's children lived on the farm, although I lived with a different branch of the family. The house in about 1952 and 1955, the way I remember it. My father added the woodshed on the left in the earlier photo. My cousin added the small porch that you can hardly see behind the oak tree in the later photo. The oak tree in front of the house was planted by my brother, Robert (Bob), born in 1922, and is now more than 75 years old. Notice the pillars in the first photo and the lack of them in the second. These pillars and some cross boards at the top were all that was left of Jim's Southern style verandah. They made a trellis for a fragrant honeysuckle that attracted busy little humming birds (and, ouch! bees) all summer long. When I built a swing between two of the pillars and pulled one down on my head, my cousin removed the pillars and replaced them with the small roofed stoop that you can barely see behind the oak tree in the later photo. Before he left the farm, my father had modernized the indoor bathroom with a flush toilet. We had one of the few homes around with two working toilets! I can remember sitting at the table studying by a gas light, so I know we didn't get electricity until about 1947. I can remember dipping water out of a pail brought up from the well so I know we didn't get piped in water until about then either. And I can remember when we got our telephone--several years after that. We still used a wood stove for heat. Our water was heated by pipes that ran through the wood stove, fine in winter but not so wonderful in summer! We got a new electric kitchen range a couple of years before the place was sold. Can you identify the McCutchen barn? It is the white spot a bit to the left of center. Notice the timber growth in the background and the burned areas that still show from the 1929 burn. 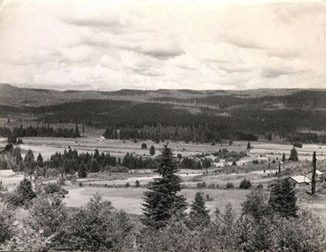 This photo was taken in about 1946 while I was living there. After the house was sold, I lost track of who owned it. It went through several changes...once two families bought it and split the house in two, with each family using one of the two stairways and part of each floor for their living space. Once it was owned by a group who used it as a children's home. One owner painted the house red, but the paint didn't last and the house went back to being weathered as it had been for years, just with an added rusty look. 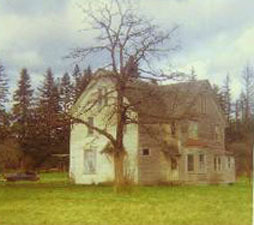 The sad old house in 1996, after it had been sold several times, painted red and allowed to weather. Notice the gingerbread trim still at the gables. The addition to the east side in the front holds a hot tub. 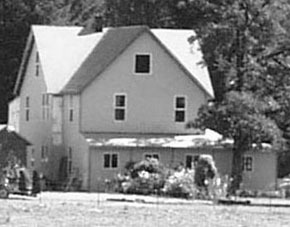 In about 1994, the house was bought by the Witts. In 1996, they rented it to their son, Lucky. Lucky now owns the house. He is gratually fixing it up, doing it all himself. He has added new windows, a new roof, new siding (and lots of insulation!) and added on to both the front and the back of the house. He has also added lovely flower gardens to the front of the place. Eventually, he tells me he plans to paint the new siding light blue with white trim. He also plans to add new gingerbread to replace the old ones he removed. Inside, Lucky is redoing every room. He removed the old back stairway and added a small bathroom to the second story in its place. 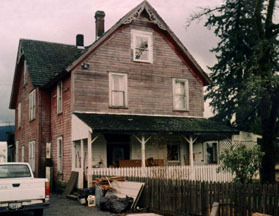 The house in 2001, after being renovated by its present owner. The oak tree is still standing and the house is again bright and beautiful! Notice that the gingerbread trim is gone. Lucky has been very kind and has welcomed family members into his home and has actually given us tours. We do try not to impinge on his kindness though, and these pictures were taken from the edge of the land near the railway track. 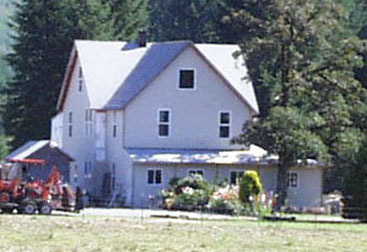 A broader photo of the 2001 house. Notice the full forests, well recovered from the burns and the clear-cut areas, including that one just back of the house. And just one last set of pictures comparison of JM's dream house, the house at its saddest, and the house as it looks today. Different views, but but still we can see the changes. Oh! And one more. My brother, Bob, makes beautiful stepping stones. He used our grandfather's dream house photo as a pattern. If you'd like a custom made stone with this design or another of your choice, email me and I'll pass your request on to him.